The years from 1950 to 1961 were the most perilous era in world history. Two nations - the U.S. and the U.S.S.R. - armed with enough nuclear weapons to destroy the world - struggled for supremacy on the world stage. In the U.S., Dwight David Eisenhower, standing at the center of this struggle, made certain the two nations did not engulf the world in mutually assured destruction. 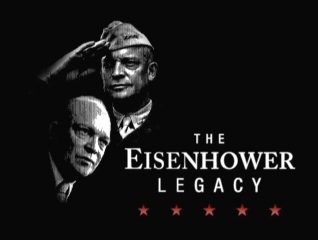 This two-part series, Eisenhower's Secret War, documents the military strategy, political decisions and foreign policy of Eisenhower from 1950, when he was named Commander of NATO, to the end of his Presidency in 1961. From 1950 - 1953 Americans were unsettled by the specter of communism and the Korean War so in the Presidential election of 1952 they looked to America's most famous war hero, General Dwight Eisenhower to secure the U.S. against communism and the Soviet menace. Produced with interviews and footage of Ronald Reagan, Gerald Ford, Richard Nixon, Citizens for Eisenhower, Walter Cronkite and John Eisenhower. 00:06:03In 1950 communism threatened the entire world - Joseph Stalin and the Soviet Union menaced western Europe, where only NATO led by General Eisenhower stood ready to defend democracy, while in Asia, China became communist and on the Korean Peninsula, North Koreans broke through the 38th Parallel to take over South Korea starting the Korean War. 2.) Chapter 2: A Political Future? 00:11:26In the build up to the GOP nominating convention for the 1952 Presidential Election, NATO Commander General Dwight Eisenhower faced two formidable Republican Party challengers - Arthur Vandenberg and Robert Taft. 3.) Chapter 3: Ike Hears "The Call"
00:13:39At the GOP nominating convention for the 1952 Presidential election, General Dwight 'Ike' Eisenhower, supported by the political group, Citizens for Eisenhower, squared off against Republican hopeful Robert Taft. 00:13:42During the 1952 presidential campaign against Democrat Adlai Stevenson, General Dwight Eisenhower, who was supported by Thomas Dewey and the Citizens for Eisenhower group, faced internal Republican Party opposition from GOP Conservatives who supported Robert Taft, while at the same time facing external problems with vice presidential running mate, Richard Nixon and his famous Checkers Speech, and the anti-communist witch hunter, Joseph McCarthy. 5.) Chapter 5: "We Like Ike"
00:10:27In the 1952 Presidential election campaign, Republican Party nominee General Dwight Eisenhower defeated his opponent Adlai Stevenson in two ways: by using the new media of television to his advantage and by promising to end the Korean War with this phrase, 'I shall go to Korea,'. From 1953 - 1961, President Eisenhower led the U.S. in a cold war with the Soviet Union - an ideological struggle of democracy versus communism, which teetered on the brink of nuclear annihilation. Produced with interviews and footage of John Eisenhower, Bernard A. Schriever, James Reston, Georgi Kornienko, Richard Nixon, Dr. Joseph Charyk, Christian Pineau, General Andrew Goodpastor and Alexei Adzhubei. 00:05:13When President Dwight Eisenhower came into office, the U.S. faced several problems, including the take over of Eastern Europe and the threat to western Europe by the Stalin led Soviet Union, the threat of nuclear war with A-Bombs and H-bombs, independence movement in the Middle East and Indo China, Communism in Asia and Red China, the Korean War, and at home the terror of McCarthyism and Joe McCarthy. 00:05:38During the Cold War, President Eisenhower had to devise a nuclear arms race foreign policy to combat the Soviet Union and communism, a foreign policy ultimately called the New Look, which included a nuclear arsenal of warplanes and ICBMs for massive retaliation, balancing the budget and covert action. 3.) Chapter 3: A Chance for Peace? 00:11:29President Eisenhower's foreign policy toward the Soviet Union changed after Stalin died and Khrushchev became the leader, and as a result, Soviet-American relations thawed somewhat following the 1955 Geneva Summit and his Open Skies proposal for checking on nuclear weapons that created a 'Spirit of Geneva' in foreign relations. 00:09:20President Eisenhower's foreign policy toward the Soviet Union and Khrushchev began with Open Skies and the idea of seeing what each side was doing, however it ran into problems with the Suez Canal Crisis between Egypt's General Nassar and Britain and France, as well as the Hungarian uprising of 1956, so at the same time, Eisenhower pursued the use of the U-2 spy plane and development of spy satellites and ICBMs. 00:08:16After the Soviet Union launched Sputnik in 1957, President Eisenhower continued to rely on U-2 spy plane flights while pushing forward in the Space Race with American satellites. 00:07:27In 1958, while the Berlin crisis steered the world toward war, President Eisenhower invited Khrushchev to visit the U.S., whereafter a meeting at Camp David relations between the Soviet Union and the U.S. improved slightly. 00:07:48At the end of President Eisenhower's term in office, the chance to end the Cold War between the U.S. and the Soviet Union, ended when Gary Francis Powers and his U-2 spy plane were shot down by a Soviet Union missile , which ended any chance of an accord at the Paris Summit.